Denman Island Chocolate, located in British Columbia's beautiful Gulf Islands, was created in 1998 by Daniel and Ruth Terry. Long interested in the organic food movement, the Terrys left the big city for Denman Island in 1994, looking for a more rural lifestyle in which to bring up their two sons and thinking of starting a market gardening business. Finding that a great many of their fellow islanders were already self-sufficient in vegetables, they turned (as ever) to chocolate, a shared love that dated back to their search for the perfect fuel while bicycle touring in northern France. 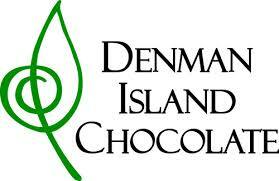 Thus was born Denman Island Chocolate, a business which caters to those who like their chocolate organic and dark. Denman Island Chocolate bars are sold in retail outlets across Canada and the United States, making it possible to eat good chocolate while looking at either the Atlantic or the Pacific, the prairies or a mountain range. Ruth died in 2004, but we continue to make chocolate the way she would have wanted us to. We are Canada's organic chocolate company and we bring you the best.